Women who smoke in pregnancy may raise the risk of their child displaying anti-social behaviour, researchers say. There was a "small but significant" link between maternal smoking and both unruly behaviour and attention deficit hyperactivity disorder, they said. The average symptom scores for both increased with the number of cigarettes the mother had smoked while pregnant, the study of 1,896 twins found. The Institute of Psychiatry work is in the British Journal of Psychiatry. The researchers said the findings did not mean unruly behaviour and attention deficit hyperactivity disorder (ADHD) were linked, although ADHD is known to increase the risk of anti-social behaviour. Previous work has linked both ADHD and anti-social behaviour with maternal smoking. However, it was not clear whether the increased risk of anti-social behaviour was linked to the ADHD rather than maternal smoking per se. ADHD is a serious behavioural disorder which experts estimate may affect up to 6% of children. People with the condition have a poor attention span and tend to be impulsive and restless. ADHD is known to increase the likelihood of anti-social behaviour. But although ADHD is thought to have a strong medical element, social factors are often blamed for unruly behaviour. The new work suggests a biological cause for anti-social behaviour. A team at the Institute of Psychiatry, in London, sent questionnaires to the parents of 723 identical twins and 1,173 non-identical twins. 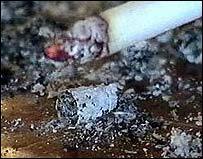 The parents were asked to provide information on their own smoking habits and on their children's behaviour. Behaviour was classed as anti-social if the child bullied others, often destroyed his or her own or others' belongings, had a habit of stealing things, often told lies or was frequently disobedient. A third of the mothers said they had smoked during pregnancy. Overall, a small minority of the children had anti-social behaviour or ADHD - 4-11%. When the researchers looked at the influence of maternal smoking, they found it contributed in a small but significant way to both disorders. The average symptom scores for both anti-social behaviour and ADHD increased with the number of cigarettes smoked by the mother. They said there were several explanations for the trend, including direct effects of tobacco smoke on the developing baby. Lead researcher Dr Tanya Button said: "The most commonly cited one is the influence of nicotine on brain development in the foetus, possibly leading to neurological impairment. "Also, maternal prenatal smoking can reduce the amount of oxygen getting to the foetus, which may also be detrimental to later behavioural outcomes." Although factors other than smoking play a far bigger part in both conditions, the researchers advised any woman who was pregnant to avoid smoking. Commenting on the research, Professor Eric Taylor, also from London's Institute of Psychiatry, but independent from the research, said: "If it is showing that there is a biological influence on conduct disorder, that is useful to know. "Obviously, we know that pregnant women should not smoke for many health reasons," said Professor Taylor, who is also an expert for the ADHD charity ADDISS. He said: "It's probably dose-related - the more you smoke the greater the risk is - and it's not just mediated through the personality of the mother or social disadvantage. "It's probably a direct effect on the developing babies." He said it was possible that the mothers were transmitting "anti-social behaviour" genes to their children.